Improve your sense of optimism by training your brain with proven exercises. Find your “happiness set point” and learn how to change it. Use resilience, risk taking, and learned optimism. Access humor skills that change neurochemistry. Tap into strategies for letting go. Recognize and change the negative messages you tell yourself. Understand that pessimism and optimism aren’t mutually exclusive. This lift-your-spirits keynote presentation reminds us all to lift our life to its highest calling and living our lives fully from a sense of possibility and the expectation of positive results. Optimism is the high-voltage power tool in the life-skills toolbox that can help you get promoted, fight off the cold that’s been going around, and attract good people to you. Pessimistic people are two to eight times more at risk of depression and are difficult to appreciate. Using humor, inspirational stories, and time-tested tips, Donna shows you how to deal with life’s trials and tribulations. We are reminded that the right to choose our own path is a sacred privilege. 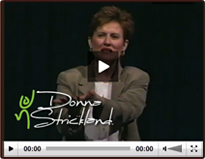 Hire Donna Strickland for a keynote presentation by contacting us directly at (303) 808-4880.